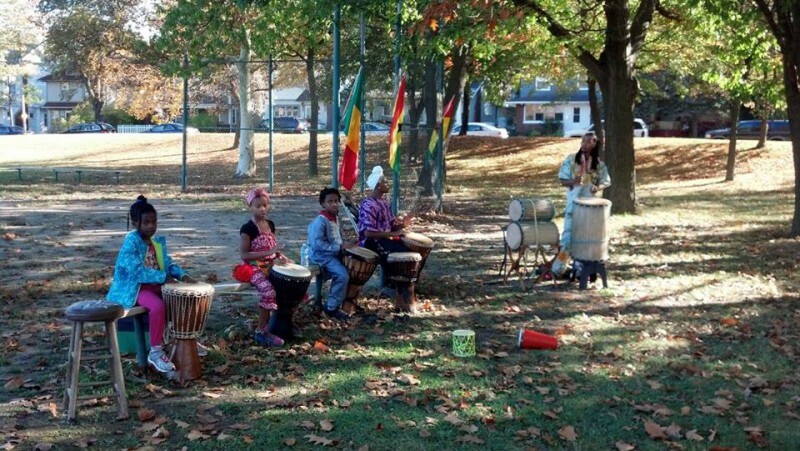 After nearly five years of Friends of GR Parks helping communities plan and design public parks and spaces, one of the undeniable trends is people’s desire to see more edible fruit and nut trees and plants in parks. The larger trend of edible parks and food forests being built across the country is the result of residents asking more from their community spaces and embracing public spaces. 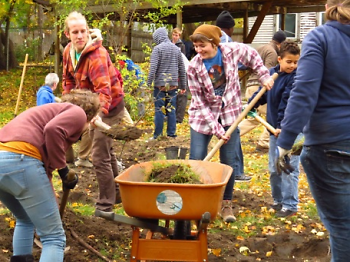 In Grand Rapids, we’ve worked with several groups and neighborhoods to help get small fruit tree orchards off the ground. These pilot projects are providing some great information about how to achieve successful projects in the future. Last November, Well House gardeners and 27 other volunteers planted a 15-tree orchard of apples and pears on the property of one of the newest additions to the Well House homes and gardens at 239 Sycamore SE. Well House is a neighborhood nonprofit working primarily in the southeast side of Grand Rapids. They offer safe and affordable housing to people experiencing homelessness. It is not a shelter, but permanent housing. Aside from the housing component of Well House, they also grow, prepare and preserve food primarily for and with tenants, but also for and with neighbors and community. With a food justice lens, they are working towards growing as much food as they can in an urban setting and sharing knowledge on preparing and preserving their own food to counter the unhealthy options provided in many neighborhoods. They believe their current food system inadequately provides healthy, nutritious food options, especially for people in their neighborhood. The Well House orchard was partially funded through a mini-grant offered through the Urban Forest Project of Friends of Grand Rapids Parks, which supplies materials, support and trees for reforestation projects within the city. The mini-grant program also helped fund a small orchard at Martin Luther King Jr Park last fall. We’ve also helped support tree orchards at Aberdeen and Riverside Parks. These orchards were planted with members of Living Green in Creston, a committee from the Creston Neighborhood Association. Technical support for the orchard plantings at Well House and MLK Park came from trained Urban Forest Project Citizen Foresters who offered demonstrations on proper planting techniques and fruit tree care. They also helped guide the volunteer planting, adding of fresh soil and mulching of the trees. However, orchards don’t make sense everywhere. When deciding on placement of an orchard, one should consider other competing uses for space and whether larger canopy trees are more appropriate. Orchards also require strong neighborhood support and volunteers that are willing to assist in their care for the long term. The trees being planted are an heirloom variety that are smaller in size, but require less maintenance and are more forgiving to a harsh urban environment. It will likely be five years before these trees start to provide any fruit, and in the meantime they require watering, pruning, mulching and weeding. If you are interested in the urban forest, trees and orchards, check out upcoming classes that you can take to get ready for spring projects. Learn the basics of continuing maintenance of trees including: basic tree biology, pruning, mulching, timing of maintenance and more. Join Friends of Grand Rapids Parks to cover the basics of tree planting, choosing the right location, and early tree maintenance. This event is free for Friends of Grand Rapids Parks members, suggested donation of $5 for non-members.